Nicola Sturgeon is "out of step" with her colleagues over transgender rights, according to a leaked online conversation between senior SNP MSPs. An image posted on Twitter shows private messages between Ruth Maguire, Ash Denham and Gillian Martin. The three exchanged messages after Ms Sturgeon said in a speech that transgender rights are not "a threat to me as a woman". Ms Maguire responded to praise of the speech by posting "FFS". Ms Denham and Ms Martin then appear to suggest that Ms Sturgeon, the party's leader, is "out of step" with the SNP group over the issue. Ms Denham and Ms Maguire also seem to question why the concerns of the SNP group at Holyrood had not been passed on to the first minister by Cabinet Secretary Shirley Anne Somerville. None of the three MSPs has commented on the leak. The SNP does not dispute its authenticity, but stressed that the party "supports trans rights and women's rights as part of our commitment to human rights and equality". Ms Denham is the Scottish government's community safety minister, while Ms Maguire is convener of Holyrood's equalities and human rights committee. Ms Martin was named as a junior education minister by Ms Sturgeon last year - before being dropped after it emerged she had referred to "hairy knuckled, lipstick-wearing transgender laydees" in a blog post written in 2007. What does the leak show? An image posted on Twitter by LGBT activist Jordon Henderson apparently shows private Twitter messages sent on 7 February after Ms Sturgeon gave a speech on human rights at the United Nations in New York. The image shows Ms Maguire commenting "FFS" after posting a tweet by Emma Ritch of the Engender organisation, who praised Ms Sturgeon for her "positive feminist analysis of trans rights". Ms Martin is shown replying: "Yup - saw it. FM a bit of step (sic) of feelings of her group." Ms Denham then says: "She might be out of step because no one has conveyed group feelings to her?" Ms Maguire adds: "Surely SA wouldn't just have ignored what everyone said?" - an apparent reference to Ms Somerville. Mr Henderson tweeted that it was "deeply concerning to see this conversation between SNP elected members claiming the FM is out of step for backing trans rights in Scotland", and called on the SNP and Ms Sturgeon to take action. What did Ms Sturgeon say in her speech? In the speech, Ms Sturgeon described her government's plans to bring forward legislation to simplify the process around gender recognition for trans people. The proposals have faced criticism by some, who are concerned about the potential impact on women's rights. 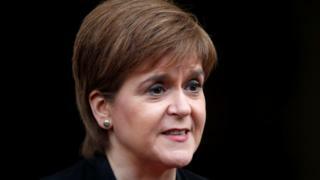 But Ms Sturgeon said: "Many transgender people go through extreme difficulties in a whole range of different ways and I think we should be doing everything we can to address that and to recognize their rights and to allow them to express those rights as fully as possible. "In my view, some of the concerns that are expressed on the part of women and feminists, while we have to listen and understand that, I think many of those are misplaced." The first minister added: "As an ardent, passionate feminist, and have been all of my life, I don't see the greater recognition of transgender rights as a threat to me as a woman or to my feminism. "But I think there is a need to bring different parts of this debate together and to try to find the way forward that will respect the rights of transgender people and recognizes and hopefully addresses some of the concerns that are expressed." What has been the response to the leak? In a statement, the SNP said it "supports trans rights and women's rights as part of our commitment to human rights and equality". The party added: "Trans people must be able to live their lives without facing unnecessary barriers and discrimination. It is important that any discussion on trans rights and women's rights is discussed respectfully." SNP MPs Mhairi Black, Stewart McDonald and Angela Crawley all tweeted their support for trans rights after the leak. Liberal Democrat MSP Alex Cole-Hamilton, who is Ms Maguire's deputy convener on the equalities committee, said she needed to give "urgent clarification as regards her position on this matter. Our committee cannot exclude any protected group in its struggle to push for equality."